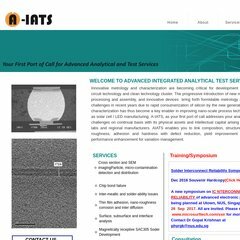 Topics: Services, Brochure, Cross Section And Sem Imaging, Chip Bond Failure, and Inter-meallic And Solder-ability Issues. ns4.w3hub.biz, ns1.w3hub.biz, and ns2.w3hub.biz are some of its 4 Nameservers. Noc4hosts Inc (Florida, Tampa) is the location of the w3hub-nginx server. A-iats.com's IP address is 68.233.242.153. PING (68.233.242.153) 56(84) bytes of data.